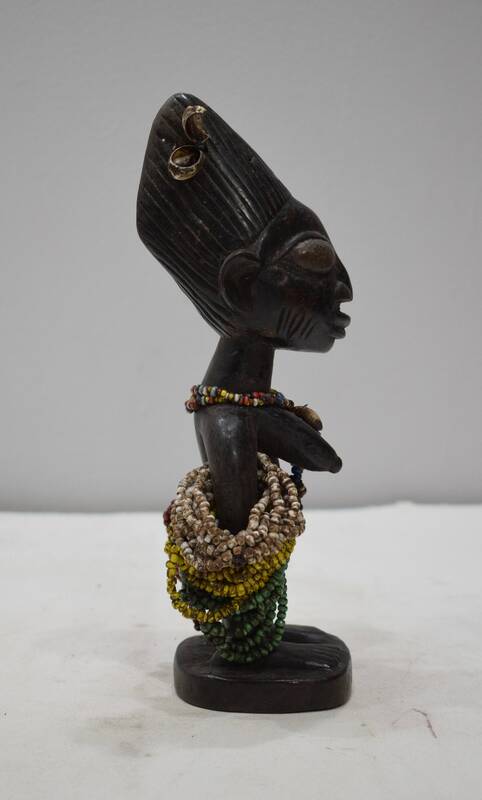 This is a Carved Wood Female Yoruba Ere Ibeji Adorned Doll with Beads and Cowrie Shells, Facial Scarification and a Stylized Coiffure that comes from the Yoruba Tribal People of Nigeria. Among the Yoruba, who have the highest rate of twins in the world, the arrival of twins is seen as both a blessing and an omen because of the high mortality rate. If a twin dies, an image dedicated to Ibeji, the deity of twins, is carved to serve as the earthly abode for the spirit of the deceased. Among the Yoruba, twins have special powers, much like the orisha, and are to be treated with respect throughout their lives. 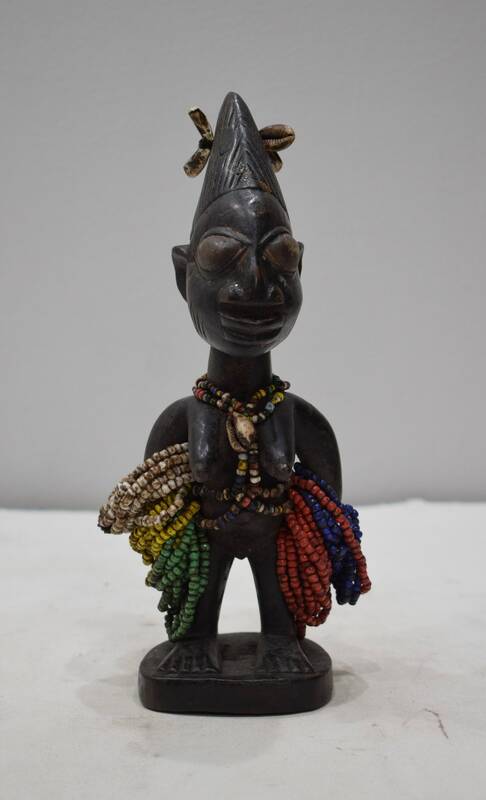 If a twin dies, the mother seeks a diviner's advice about which carver should make the ere ibeji to stand in for the dead child .The mother treats the ere ibeji as if it were alive, feeding, dressing, and bathing the image. The responsibility of caring for the ibeji is borne by the mother and female family members of subsequent generations. The sculpture is expected to avert evil from the household, strengthen the manifestations of family love, stare down death, illuminate the pathway through the valley of immortality, and bring good fortune to all who treat it with respect and offer it tokens of affection. 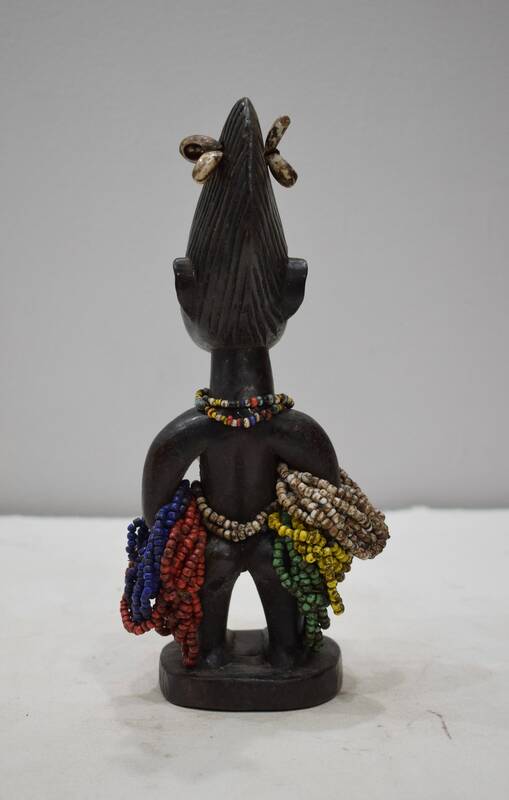 It is kept standing during the day, and is laid down at night, and it will be dressed in the same clothing as the living twin, or be decorated in a beaded cowrie shell vest. 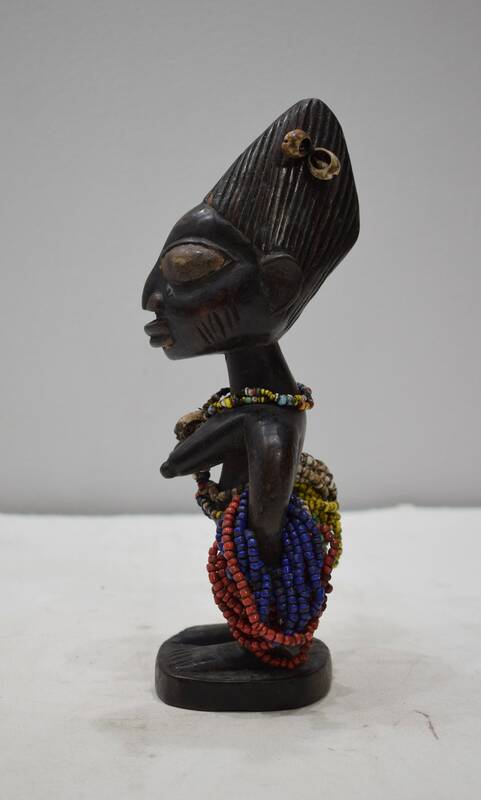 This doll would be a wonderful addition to your collection or home.